In the Christian liturgical calendar Lent begins on Ash Wednesday and ends approximately six weeks later, before Easter Sunday. Lent is traditionally described as lasting for 40 days, in commemoration of the 40 days the Christ spent fasting in the desert. 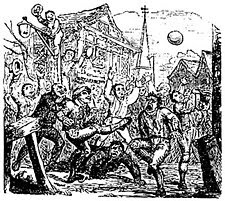 On the eve of Lent (last day of Shrift) or Shrovetide, from the 12th century, a game of football was played in the streets and open spaces of Ashbourne in Derbyshire. The rough game between two Derbyshire towns is often credited with being the source of the term "local derby". There were few rules, no set teams and the bore no resemblance to the 'beautiful game' we see today. 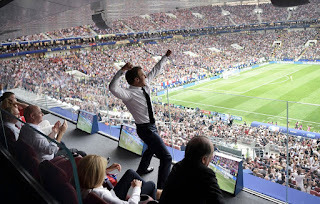 This was a literal free for all, originally played some believe, with a severed head after an execution, but later replaced with a 'hugball' the precursor of the modern football. 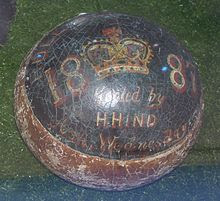 In the history of he Royal Shrovetide Football Match there were many injuries and deaths recorded. The game was played on open ground and any vacant spaces including the parish graveyard. Needless to say authorities disliked the game and many attempts were made to ban it from the streets. Similar traditional footie games were played throughout the UK from the Early Middle Ages with Christmas and Easter popular times. Royal Ashbourne Shrovetide is still played but the games are (a little) less rough than the original, although still vigorously contested. In Chester, England the fifteenth century custom was for the local shoemaker to present a ball valued at 50 cents to the local draper. The ensuing game was boisterous and dangerous. So much so it was banned in 1539 and footraces were substituted instead. The town of Derby had a similar game fought between two bitter rivals, the men from St Peters and All Saints parishes. Played between two goal posts, which were position at opposite ends of the town, sometimes three miles apart, the game started at mid-day and lasted well into the night. Casualties were anticipated and injuries including fatalities, common events. Such was the commitment to win the term ‘local derby’ came to represent fierce local rivalry. Concerns for public safety became so critical that the Derby game was outlawed in 1846. It took the reading of the Riot Act and troops of dragoons and special constables to convince the citizenship the game was at an end. During the nineteenth century similar local traditions were stopped in Kingston on Thames and Dorking. Some contests did survive into the twentieth century like the Chester le Street in Durham), dual between the Up-steeters and Down-streeters. This was however stopped in 1932. The only surviving urban footie in Scotland occurs in Orkney on New Year’s Day. The battle between the Uppies and Doonies on Ba' Day, still rages to this day, and regularly has a large list of casualties with very occasionally some seriously injured participants. Shrovetide football represents territorial rivalry often between North and South dwellers, later this came to include trades rivals and religious divisions.